Paragliding (known as paragliding from the French name Parapente) is the newest and simplest atomic gliding. Is the flight using a special parachute and off from a slope in height, the operation of the updraft of wind in front of the slope. Paragliding or parapente is easy, convenient and economical flight device that can offer us incredible images, experiences and unforgettable moments of joy and happiness. This is an invention of the French Alpine, which in the 70s had tried to descend from the mountains that went up with an easier and much more fun way. This way the next decade evolved into a new sports and the first schools made their appearance in France from where comes the generally used name of which means parapente paragliding to Greek. The development of this new sport was and is even more in recent years as a result we now have wings incredible performance than originally and record distances exceeding 500 km! The spread of paragliding around the planet is years event with leading countries of central Europe where the activity is widespread and integrated as part of alternative forms of action and tourism like mountain biking, kayaking, mountaineering climbing etc. In Greece the late 80’s he the pioneers of the sport and the number of those involved is constantly increasing. 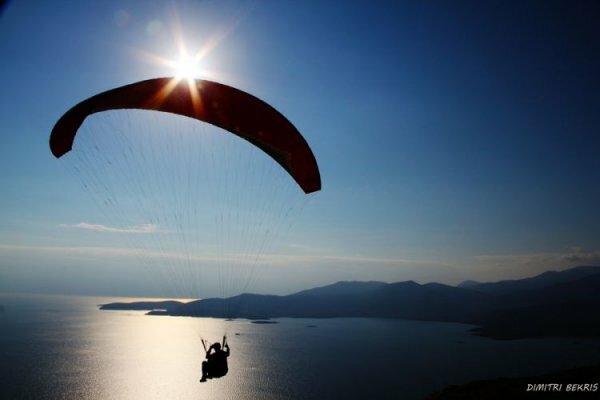 Ever dreamed to fly; Paragliding is precisely this dream! You can fly as a passenger in a two-seater paragliding and experience the most direct and pure flight form ever known to man! Not required to “jump” into the void, the wing is fully formed and will fly before you leave the ground !!! If you can make a few quick steps, then surely you can fly! The flight Paragliding parachute generally possible for anyone not exceed 110 pounds. The Tandem flights take place at Plataea in Boeotia and Megara Kandili. Weather permitting we will seek you go up so you see the world from another angle that will certainly nostalgic for some time after your landing! 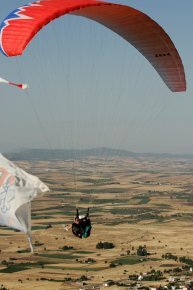 We have highly experienced and certified pilots two-seater paragliding (discrimination and first place in the Greek Championship, and members of the national team for many years). The equipment is the latest technology in order to make your ride the skies, as easy and safe could be! Our first priority is your safety and second to have a huge smile of satisfaction after your landing! All you need to do is to wear a pair of boots, a windbreaker and can come to the predetermined meeting place. The rest will take care of us !!! For more information contact us.